I tried to get 8 hours of sleep but ended up with about 4 hours. However, I also had a shower and a great lunch. The plane had to go in for maintenance so Eric and I were moved into the same room for another night. We were offered ATV's to go exploring with. We headed out to find the ice cave shown in Figure 1. We experienced some of the artic environment and practiced our ATV skills. We also got to see some interesting scenery. A lot of our trek covered loose rock. It was common to see rocks cleanly split in half, probably by freeze/thaw cycles. We developed an immediate appreciation for that class of vehicle for exploration in a remote area. Figure 1. The Ice Cave near Resolute. 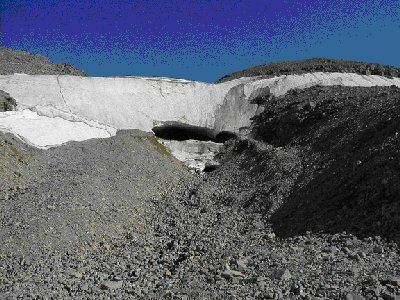 The ground is covered with loose rock from the cut in the ridge over which the ice formed. The area was noisy with falling pebbles, dripping water, and a small current of slush down the side. I also took the opportunity to go over with Eric some of the ideas I had to share development and operational costs of a Mars mission. Since he has a degree in economics from Princeton and has been working in this area for years, he was an excellent captive audience. I see this type of interaction as one of the most useful from this expedition. That is the ability to focus one's attention on the issue of Martian exploration and infrastructure development without so many of the diversions of contemporary life. We made the best of being stuck in Resolute an extra day by having internet connections, telephones, great meals, a shower, plenty of water, laundry, and real beds. I was also interested in Resolute Bay's utilities, goods, economy, and visitors. 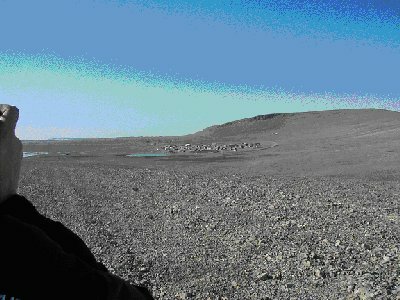 Resolute Bay could be considered an analog of a terrestrial-supported Martian outpost. If it had the capability to perform some limited manufacturing using local resources, it would be an analog of a Martian colony. Figure 2 shows the extent of the hamlet. Figure 2. The 200 person hamlet of Resolute Bay except for the airport and power plant off to the upper left. Eric's hand is blocking the view of the bay off to the left. Notice the loose rock which covers most of the surface. I contacted FedEx and found out that the remote station had passed through customs. However, no firm delivery date could be set. If it doesn't make the Saturday shipment, then it will not be here in time for me to install it. I spent a little bit of time studying the installation instructions for the remote station. Also, I put together a status for Mission Support at then end of the day. I consider it critical to keep them informed since they will be intimately involved in bringing the remote station on-line.